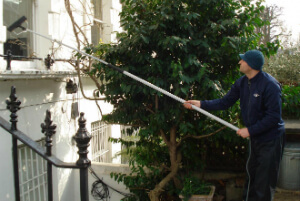 Domestic & Commercial Window Cleaners North London BR | Quality Property Care Ltd. Enjoy much more than just professional window cleanup, give Quality Property Care Ltd. a call and reserve the very best window cleaning in North London BR at a reasonable price. Fully capable and equipped, we will leave no spots behind, taking away not only oil, but built up mud, grime, dirt, fine powder, mud, rain residue, fingerprints and a lot more. We are delivering a proper outside window cleaning for displays, big bay windows, for shops, domestic buildings up to 4 stories in height, conservatories, garden windows and even patios and gutters. If you have a store on a busy block and want that window cleaned, we can cope with your needs, no hassle or extra fees. We take our own devices, fully set to tackle any spot or window cleaning situation that you want solved. We bring ladders, gloves, detergents, towels dirt extractors, squeegees, vacuum , telescopic poles for the squeegee and some pure water. To keep the inside of your property clean, our staff uses overshoes to minimize the dirt visibility of the windows. Depending on the stains in question, we use a detergent or simple water . Often a wipe down with a micro fiber cloth to remove fingerprints is sufficient. This is performed using our water purification system attached to a water fed pole. The whole system sits compactly in the van, allowing for mobility. A water purifier strips regular tap water off of its minerals and other chemicals, leaving it a bare water compound. This type of water is called purified water, it connects a lot more speedily to dirt and grime due to its denaturalized state. There is no trick, no smoke and mirrors, just simple pure tap water eliminating accumulated grime and dirt form your windows. Our cleaner starts from top to bottom, beginning with proper window frame and sill cleaning to removing any grit and debris, then he moves onto the glass itself. If the day is particularly windy we hand dry the window with cloths to stop further saturation. Secured rope access window cleaning, totally danger and chemical-free cleaning! Quality Property Care Ltd. works with all kind of commercial properties, all kind of home properties and does it at very affordable rates. We add sticker removal procedure, if needed, as well as modern rope access window cleaning procedure for houses, buildings, blocks . Don`t forget to mention, if you need urgent or same-day service. We are flexible and helpful, so we can fix the residential window cleaning service in a most convenient for you way. We work 365 days per year - no exceptions either for weekends or holidays. Re-scheduling is possible and 100% free. So no matter if you are in dire need of the professional commercial windows cleaning service or the residential windows cleaning service provided by Quality Property Care Ltd., all you have to do is book the service or services you need, and you will ensure that the light shines brighter in your home or office again. Just phone call 020 3746 4287 or send an online booking require, and our customer care service will be back to you as soon as possible. You will get written confirmation for the reservation. There is no down payment necessary, and you will pay for only after the service has been completed. The costs options accepted are flexible. No hidden fees, and big deals for returning customers or for those purchasing more than one service at a time.